Happy new year 1907! On January 1st Herriman covers the on again-off again Jim Jeffries comeback fight. Things aren't looking good, as the headline confirms. So Jeffries gets comfy while a couple of pigs get busy. Slipped that one past the editor, eh, George? 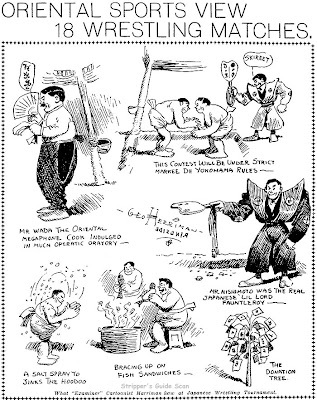 On January 3 we witness what may be a truly singular occurrence in American newspaperdom -- the Examiner prints a sports page cartoon about a Sumo match! 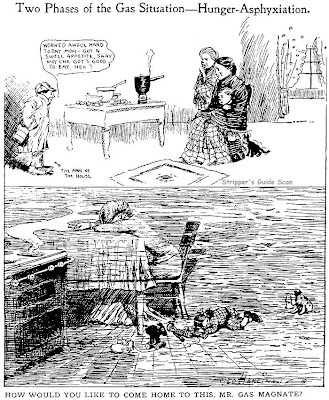 Perhaps more amazing still is that Herriman doesn't take the low road -- the humor is observational, not over-the-top racist as with most everything printed about Asians in the west coast papers of this period. 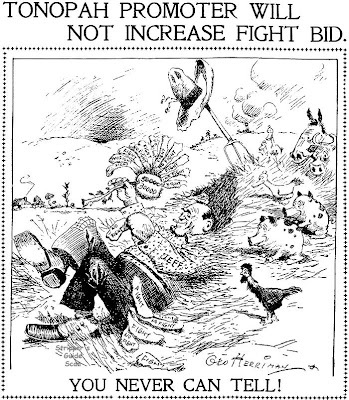 On the 4th Herriman goes after the gas companies again. The gas service in San Francisco at the time was very undependable, and unlike when the electricity comes back on after a power outage, an open and unlit gas jet become an insidious instrument of death when the service is restored. Chilling stuff, no pun intended. Jim Ivey supplies a weekly comic strip here for your enjoyment, and is drawing up a new series based on the encouraging positive commentary you gave on the original 46 week series "My Other Life". 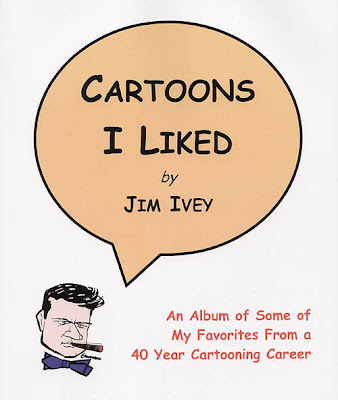 Also based on the apparent interest here in his work, Jim and I put quite a bit of effort into producing the book "Cartoons I Liked" described in the post below. We assumed that you might like to see the sort of work Jim was famous for during his distinguished career as an editorial cartoonist. I can speak freely here because I will delete this posting before Jim sees it. Granted the book has only just become available, but I can see based on Lulu's seller tools that only a few of you have gone to look at the book there, and there hasn't been a single sale as yet. The book is available there with an option of purchasing for as little as $3. If you want to let Jim know that you appreciate all the work he puts into producing his Sunday comic strip series go buy a copy. Nobody's looking to get rich here -- consider buying a copy as a very cheap vote for the continuation of Jim's weekly appearance here. Don't put me in the position of having to tell Jim that his book sold 0 copies folks. As things stand would you blame him if he said to hell with it and asked for his Sunday appearances here to end? 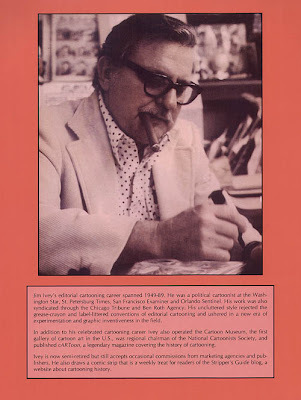 PS -- if the reason you haven't ordered the book on Lulu is that you're busy writing a letter of appreciation and ordering a personalized copy from Jim, please forgive any affront in this peevish post. You have my deepest gratitude and thanks. I'd like to be the first to say that I'm happily in the "PS" category, and can't wait to finally get word off to Jim that I'd love a personalized copy of, what sounds like, a really fun book! I also owe him, long overdue I might add, a look at the Wesley Morse drawings from my collection. He was gracious enough, through Allan's help, to speak to me aways back regarding Wesley. "Sorry Jim, for further debunking a really great urban myth...three -ahem- friends from Chicago, indeed!". Thanks again Jim, and I'll be in touch...looking forward to your book. Thanks for the support! Now if a few more folks would do likewise (we're up to ONE sale on Lulu as of Monday) I'd be a much happier boy. One of the most unique features ever to appear on the funny pages was Jack Wohl's PIXies. Wohl must have been a glutton for creative self-flagellation because in this feature he limited his characters to numbers, letters and common everyday objects. No humans need apply, in fact no animate objects of any kind. Wohl did an amazing job of coming up with creative ways to milk his strictly limited subject matter. His creativity in coming up with delightful gags, especially with fonts and letter shapes, seemed practically unbounded. Now anyone with a half-decent imagination could make a go of a concept like PIXies for a few months, maybe a year or two, but Wohl turned out the feature for over two decades. And for much of the time he did PIXies it was far from the only thing on his plate. Wohl had at least one additional feature going for a good part of that time, and, at least when he started out, was also an executive at an advertising firm on top of it all. PIXies started as a daily one-column panel on May 16 1966. A Sunday was added but never really caught on -- in the Des Moines Register, one of the few papers to carry it regularly, it ran from March 19 1967 to July 11 1971. The more popular daily panel forged on until December 28 1987. A few PIXies reprint books are long out of print but still available pretty cheap -- they're definitely on the recommended reading list. Is this Wohl the same guy who used to do "Wohl Nuts" in the earlier issues of Harvey Kurtzman's HELP!? I would think so given the nature of this strip and "Wohl Nuts"' usage of photographed household objects, foodstuffs (eggs, nuts...) and whatnot to create a series so good that even satire mag biggie MAD swiped a few ideas. Thanks for all the good work in detailing these comic rarities that you've done...please keep 'em coming! I'm not familiar with "Wohl Nuts", but I know Wohl did at least one book of captioned photos, so it's pretty likely the same Wohl. 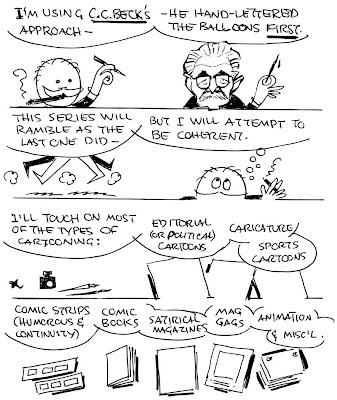 Can you follow this up with Jerry Robinson's similar talking objects strip? Dean Martin Show, Laugh In and many more TV shows. He was also the producer & writer of many TV shows and has won awards including some Emmy's, etc. He was lyricist for the Broadway musical Chu Chem. Mr. Wohl is recently associated with Tales From The Cyrpt, and is still writing for TV. Marjorie Henderson, world famous as Marge, is known for creating Little Lulu, the mischievous little girl with the corkscrew curls for the Saturday Evening Post. A decade before Marge struck gold with Lulu, though, she dipped a toe into the world of newspaper syndication when she created The Boy Friend for Ledger Syndicate. The Boy Friend was one of a torrent of single-column panel features created to capture some of the market that had been discovered by Ethel Hays with her Flapper Fanny. Marge gets a little credit for at least being original enough to turn the tables on the flapper panel by focusing on the boys instead of the girls. Flapper Fanny debuted in January 1925, and The Boy Friend followed on June 8 1925. As with most of Hays' imitators, the panel never really took off and is most often found in small papers running on a space available basis. The panel ceased sometime in 1927 but can be found popping up in newspapers for several years after that, probably because the Ledger Syndicate was continuing to sell the feature in batches after its initial run. Hello, Allan-I found THE BOYFRIEND beginning on June 1, 1925, in the PUBLIC LEDGER's tabloid, the Philadelphia ILLUSTRATED SUN. ---Cole Johnson. Ah, life is good. Jim is back with more! Eagerly anticipating this new Jim Ivey series. Loved the intro strip. "Will attempt to be coherent" busted me up. Letters first, but after a loose layout right? or literally letters first?